We are looking for energetic 3rd-8th graders to cheer on our football teams. Cheer is full of activity and athleticism that builds character and teaches teamwork. You should come join us for an exciting season. Do not miss all the fun! Practices in August are 5 days a week. Sept/Oct practice days decrease to be determined. We follow football game schedule & rain out rules. We have away games and parents need to provide transportation. Cheerleaders are responsible for the cleaning of their summer uniform, which is included with the fee. 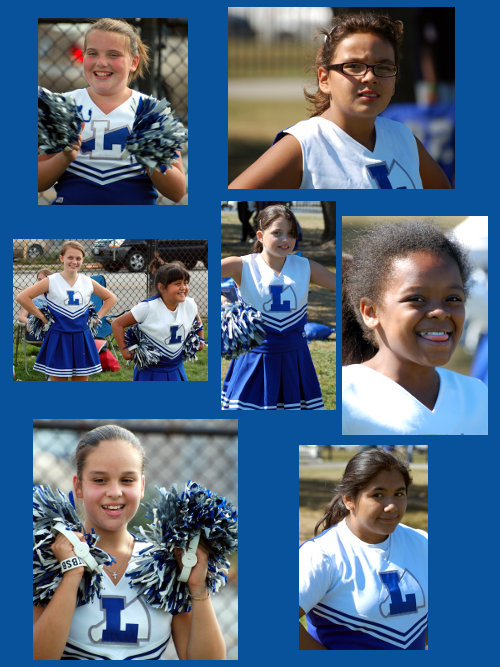 Winter uniforms are earned (kept) by cheerleaders by fundraising, donations & parent responsibility. Parents & family are always encouraged to attend practice every day and games, and become part of the Lion’s family! Our season ends with the football season.